Great post on Tim Burton etc. I have no intention of contributing to it's 'boffo', but there are few films where the trailer alone makes me seethe. Funny enough, I think Burton - and Depp - represent a lot of the neoliberal arrogance that you point to with regards to 'Captalist Realism'. I see it relating to the hideous state of British TV and pop music these days. Lacking any imaginative courage (and worse - any faith in the public imagination), the 'suits' decide what they think makes us interested, the already established and overexposed get another chance to irritate us, and 'what the people want' becomes as mysterious and manipulated as the word of God (does Depp actually guarantee a hit, as only about three stars actually do these days?). It does indeed become a case of being culturally 'policed' by 'lawmakers' who themselves don't have a clue about the 'law' (or indeed if one exists). They seem to willfully forget that true 'cultural phenomena' (the ones that actually do generate unbelievable long-term profits and make a cultural impact) were considered very risky when they were 'pitched' - Star Wars, The Simpsons, HBO drama, Pixar, Seinfeld, Marvel superheroes, Dr. Dre's hit machine etc. etc. - they all came from 'the outside' to varying degrees (without anything left to appropriate, all capital has to process is its own washed up imaginative resources?). Now it's all 'tough guy' capitalism with the kind of safety nets considered 'unsustainable' or 'mollycoddling' for smaller cultural enterprises (or indeed the majority of society). The modern 'bucaneer' capitalists pride themselves on AVOIDING risk. As for Tim Burton - it seems personal. He's managed to take what I loved as an 8-year old and concoct 're-imaginings' (regime change) into their worst versions (perhaps of any medium) - Batman, Planet of the Apes, Alice, Sleepy Hollow, Charlie and the Chocolate Factory etc. (I dread him getting his hands on Frankenstein, Alan Garner or even Dennis Potter) The 'big questions', subtexts and cultural specifities (which of course any child could understand) become 'therapeutic' allegories about rich L.A. teenagers who feel like 'outcasts' because they liked Siouxsie while the rest of the school dug Duran Duran (what's 'at stake' in a bubble free from peril or risk). He even managed to this with Planet of the Apes - removing any of its obvious pulpified references to class, race, religion, nuclear war and species extinction - all of which was easily contemplated by my inner-city primary school). And this becomes neoliberal discourse's extreme of 'weirdness' and 'imagination' (how many articles have we seen about Burton's 'unique' imagination)! Infantilising children indeed. If it isn't (rich) adults shoving dog-eat-dog neoliberalism into children's texts (especially in 15, 18 rated movies/music sneakily 'sold' to kids), it's the shameless celebration of limited, timid 'imaginations'. Although I was never a big fan of Disney, he at least INNOVATED and RISKED with his cultural colonisation. Sorry if I've gone on a bit, but Depp and Burton really do touch a raw nerve for me (in a way that sanctimonious dimwit plagiarist James Cameron doesn't). You do seem to have an uncanny knack for bringing up stuff I think about a bit too much! 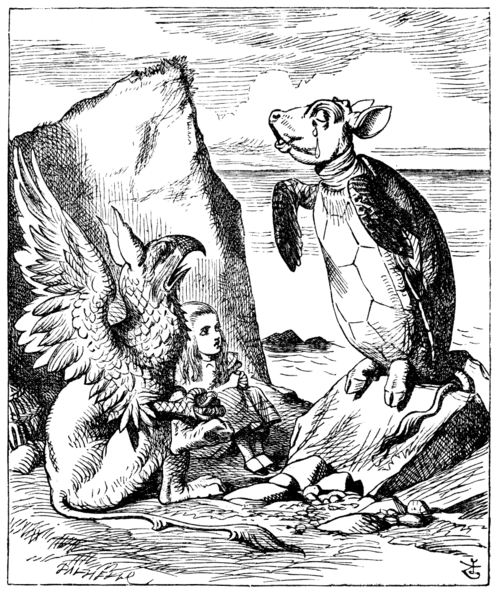 Just a few points that may be of interest – Watching the ‘tea party’ scene from Jonathon Millers version of Alice In Wonderland, I was put in mind of Wittgenstein and his attempts to tease out the nature of our language by estranging it from us. I’m coming more and more to the conclusion that Wittgenstein’s approach to language in his latter works has an affinity with Lacan. In a sense you could see Wittgenstein as trying to unseat our view of the symbolic order/language as founded on objective, rigorous logic. Logic, Wittgenstein argues, is ultimately tautological, which, in Lacanian terms, is perhaps another way of saying that the symbolic order is ultimately self-referential/self supporting. Your insight regards ‘Alice In Wonderland’ as expressing a child’s perspective of the adult world, as made up of incomprehensible rituals and arbitrary conventions, is almost like a dramatisation of Wittgenstein’s point about the fact of ‘rule following’ not having any ultimate justification in logical/symbolic terms. The best you can offer for why you’re following a rule is by ‘pointing’ to or explaining the rule, which explains nothing. I think Wittgenstein’s latter work was trying to invoke the symbolic vertigo of wonderland as a means of pointing out just how little grounding the symbolic order has. Anyway, I’m sure this has all been thrashed out before, and no doubt more lucidly, but I was just wondering why discussion of Wittgenstein doesn’t crop up in your posts? The parallels between Lacan and Wittgenstein seem numerous. Anyhow, sorry to waffle on! I knew the Burton film would be a load of toss, and I couldn’t agree more with your critique. Another thing that may be of interest regards your discussion of the fate of popular music: I’m a music composer for various production companies, or what used to be called a library music composer. A few weeks ago I was discussing with the boss of a new production company the status of the music industry. The music business, as we all know, is in crisis regards record sales. Their solution to this problem is to exploit advertising, by securing deals with TV networks or commercial companies to have their artists featured as musical accompaniment to television shows or adverts. This trend is intensifying to the point that companies who produce music specifically for the media market feel their market niche is threatened. The guy I was talking to even used the political analogy of how notions of left and right amongst mainstream political parties have dissolved to explain how the traditionally conceived difference between popular music and library music no longer held! Strangely enough this new approach to how music is consumed cuts both ways - I find that music I’ve composed for production companies has found its way to Youtube, and is being appreciated outside of its original context. The whole rationale behind this guys business is to capitalise on this ambiguity, by providing music that is amenable to both commercial media usage and ‘private’ usage, (and no doubt the industry is thinking in similar terms). I’m not necessarily suggesting that his approach will become the norm, but the very fact that this notion is being discussed certainly supports some of your arguments regards the declining cultural autonomy of popular music in an age of capitalist realism. Great entry on Burton's Alice, which I haven't seen (and had no intention of seeing). But you must, must see the J Miller version - your hunches about it, from an isolated clip, are entirely correct - it IS highly entropic, swirling with the stagnant dust of high Victorian imperialism - no animal costumes at all (a stroke of production-design genius). And your equation of Beatles tracks are bang OTM as well - I wrote about the film in relation to psychedelia in my book - in fact the group went into the studio within a week of the broadcast, on 1 Jan 1967, to properly start work on Sgt Pepper's, and I'm convinced the promotional film they made for Strawberry Fields Forever - shot at the end of that month - is highly Carroll/Miller influenced (backwards/slow motion, sharp focus-pulls, a very weird tree, a disembowelled piano). have you ever read the original 'Mary Poppins' books? A long way from Julie Andrews' already-retro-Fordist (masquerading-as-retro-Edwardian) supernanny, MP is presented as this sort of cosmic superbeing explicitly because she's able to occupy at one and the same time the position of the inscrutable Other, the pre-Oedipal Cosmic (the Real which, we are told, entry into language directly deprives the ordinary infant of access to...there's an incredible scene in which she converses with a newborn infant who refuses to believe her when she tells him that within a year he will no longer be able to converse with birds or hear the music of the spheres) and the fairytale Imaginary (the only bit that Disney focusses on, of course). I read them all when I was nine and remained quietly fascinated all through my teenage cyberpunk / Lovecraft / High Modernist phases - eventually tried to write an essay about them as an undergraduate just to nail what the fascination had been, and why it was Kafka, of all the books I'd read subsequently, which seemed most reminiscent.